The leaders of the United States, Mexico and Canada have signed a new North American trade deal, underpinning $1.2 trillion in annual commerce among the three countries. President Trump is calling the signing of the U.S.-Mexico-Canada Agreement (USMCA), following 15 months of frequently acrimonious negotiations, a "very historic day" for a "truly groundbreaking achievement." The pact will lock in U.S. market access to Canada and Mexico, expand American exports and includes new measures to ensure fair competition, explained Trump as he stood alongside Canadian Prime Minister Justin Trudeau and Mexican President Enrique Pena Nieto. "The autoworkers are a tremendous beneficiary," said Trump, adding that the USMCA will help stop automotive jobs from going overseas, and he predicted many such jobs will return to the United States. The agreement’s intellectual property protection will be “the envy of nations all around the world,” said Trump at the signing on the sidelines of the G-20 leaders’ summit in Buenos Aires on Friday morning. "We’ve taken a lot of barbs and a little abuse and we got there," Trump said thanking Trudeau and Pena Nieto. "It's great for all of our countries." It will be a while, however, before the agreement can take effect as lawmakers from all three countries must approve the USCMA. "It’s been so well-reviewed I don't expect to have much of a problem" getting the pact through the U.S. Congress, Trump said at the signing ceremony. "It's going to be a very tough sell," predicts Congressman Bill Pascrell of the state New Jersey, who is one of the top Democrats on the House subcommittee that oversees trade issues. The opposition Democrats take control of the House in January. The National Association of Manufacturers is calling for swift approval by U.S. lawmakers. “With 2 million American jobs dependent on exports to Canada and Mexico, Congress should move expeditiously to review the USMCA before the end of this year. We look forward to working with the administration and Congress to ensure the USMCA is implemented and enforced in a way that empowers manufacturers in America to continue investing in our people and our communities,” the powerful business group said in a statement released shortly after the signing ceremony. Trump noted the signing in Argentina comes on the last day in office for the Mexican president, who is being succeeded by leftist Andres Manuel Lopez Obrador, elected five months ago. “It is really an incredible way to end a presidency,” Trump said to Pena Nieto, promoting applause from the Mexican officials in the audience. Pena Nieto also said the new agreement provides improved protection of workers’ rights and the environment. His government is officially calling the pact the Canada-US-Mexico Agreement (CUSMA). “Make no mistake, we will stand up for our workers and fight for their families and communities,” added Trudeau. The signing of the so-called free trade agreement comes at a time when tens of billions of dollars of tariffs remain in place on goods traded among the three countries. 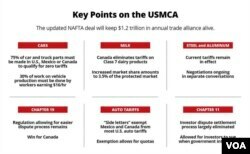 “Tariffs on imports of steel and aluminum are entirely inconsistent with the overall goals of the USMCA,” according to a letter signed by the U.S. Chamber of Commerce and groups representing auto, chemical, grocery, retail and agricultural interests. Retaliatory tariffs by Mexico have harmed U.S. dairy and pork farmers. Mexican negotiators reportedly desire modifications to limit future metal shipments to the United States to 80 percent of current levels, while Canada is resisting quotas in the face of inexpensive steel from China entering the American market.